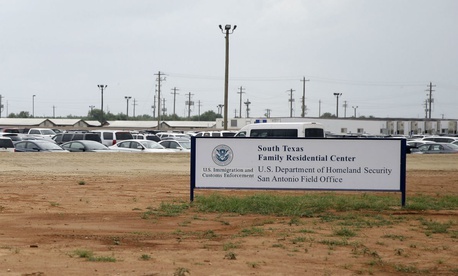 The nation’s largest immigrant detention facility was procured improperly, according to a watchdog report, with Immigration and Customs Enforcement in 2014 using an existing agreement with a town in Arizona as a vehicle to establish the center 900 miles away in Texas. Since 2014, ICE has spent $438,000 annually for Eloy, Ariz., to serve solely as a middleman for a 2,400-bed detention facility in Dilley, Texas, according to the Homeland Security Department’s inspector general. The agency first contracted with the city of Eloy in 2006 to establish the Eloy Detention Center, which the city subcontracted to a company called CCA. ICE reached the agreement with Eloy through a process known as an intergovernmental service agreement, or IGSA. After an influx of unaccompanied minors and families illegally crossed the border in 2014, ICE looked to boost its detention capacity in south Texas. The agency asked CCA and another contractor to submit proposals for a facility, but only CCA responded. The contractor negotiated directly with ICE on the provisions of the agreement. Rather than create a new contract, ICE went to the city of Eloy and requested that it modify its IGSA to enable CCA to run the South Texas Family Residential Center. The Eloy City Council gave its consent, and the agreement was altered. The provision was set to expire in October 2016, but ICE extended it until 2021. ICE officials told the IG they chose to modify the IGSA because it was “more expedient” and offered “much greater flexibility” than a normal procurement process. The auditors identified several problematic elements of that decision. First, ICE’s legal adviser in the Commercial and Administrative Law Division told the head of contracting that modifying the Eloy IGSA was “not legally advisable” and the city of Eloy would “exercise minimal operational control” over the Texas facility. The IG also noted the original agreement with Eloy was to detain only adults, whereas the Texas center detains families. Finally, the watchdog faulted ICE for negotiating directly with the subcontractor rather than the entity legally responsible for the agreement. ICE management disagreed with the IG’s findings, saying intergovernmental agreements are exempt from competitive contracting rules and the Federal Acquisition Regulation. The agency also maintained that the modification was within the scope of the original agreement and it secured a reasonable price. The auditors countered that ICE could not justify the added layer in the contract. The auditors further recommended that ICE develop procedures for “negotiating, executing, and modifying” its intergovernmental agreements, as it currently has no set policies in place. Without them, they said, ICE cannot ensure its use of IGSAs is proper or consistent. ICE agreed to clarify that process, but the IG said it considers the specific South Texas issue unresolved.